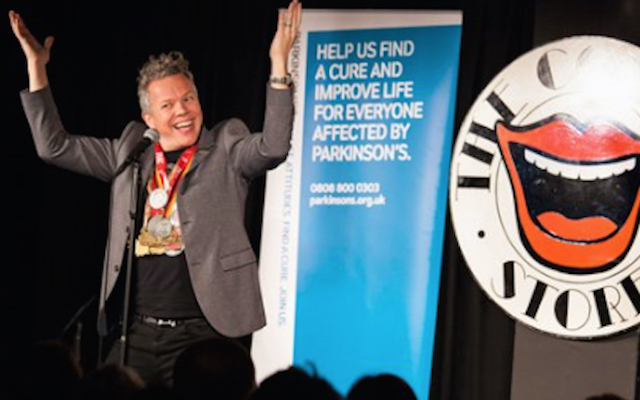 Rob Deering has produced and hosted Parkinson’s UK’s annual gig series ‘Shake with Laughter’. He presents the podcast ‘Running Commentary’ with fellow comic Paul Tonkinson. He has also made several appearances on UK quiz shows, where he has donated all his prize money to Parkinson’s UK. When and how did your family notice that your dad had Parkinson’s? I remember him having the tremor and us not knowing what it was. So when he was diagnosed in 2001, we were relieved to find out why it was happening. He had worked in logistical management before he took early retirement because of his condition, and immediately got involved in what was then called the Parkinson’s Disease Society (now Parkinson’s UK) and put his skills to use there. His mix of medicines has changed over the years, as different ones are effective for different people. He also now has Parkinson’s-related dementia. So he is in a nursing home now, but he is also full of beans and still very chatty. When did he develop the Parkinson’s-related dementia? It was that classic thing – my mum and my dad were very close in terms of how they spent their time. So the gradual shift from partner to carer is almost imperceptible at first, and then suddenly you turn around and you think: “Ah…” And then in the end, it’s like: “Oh my goodness, I’ve not got the skills for this.” So, two years ago we decided to get some help from the medical profession. What made you decide to run marathons to raise money for the cause? Well, about 10 year ago, I lost a lot of weight. I’d never really been a very fit guy, but I decided to start running three times a week. And much to my own surprise I actually loved it. But it felt like a selfish use of my time, and I thought I could do something useful in my Dad’s honour, so in 2010 I signed up for my first big run. So how many marathons have you done so far? I’ve done nine. It should have been 10, but I had to cancel one this year because I injured my foot. I’ve done the London marathon five times (2011, 2013, 2015, 2016, 2017), the Yorkshire marathon twice (2015, 2016), the Berlin marathon in between those two, and just last month I did the New York marathon. My place in the New York marathon was part of a reciprocal exchange with the Michael J Fox Foundation’s Team Fox runners. They came to London, and I went out to New York, where there was a very nice welcome dinner. Michael J Fox gave an excellent, funny speech about everyone who was running for them. And then he came and met everyone, so frankly, that was the best thing that happened in New York, and the marathon came second! Which one was the most memorable and why? It was pretty amazing going to New York, but it was also really tough. I wasn’t very fit after my foot injury. Having said that, the London marathon is truly amazing. I think it’s something everyone should do at some point of their lives. 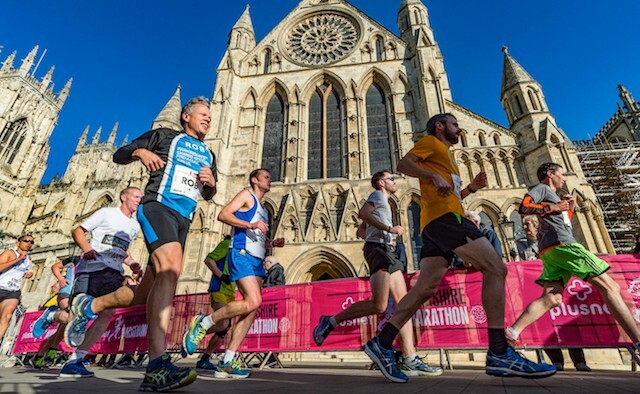 And how much money have you raised from running these marathons? I know that I’ve passed the £90,000 mark, and then I know there is at least £3,000 to add to that. What I’m hoping is to be fit enough to do the London marathon again in the spring. That would be my tenth marathon and I’d be trying to reach the £100,000 mark. Fingers crossed for that! 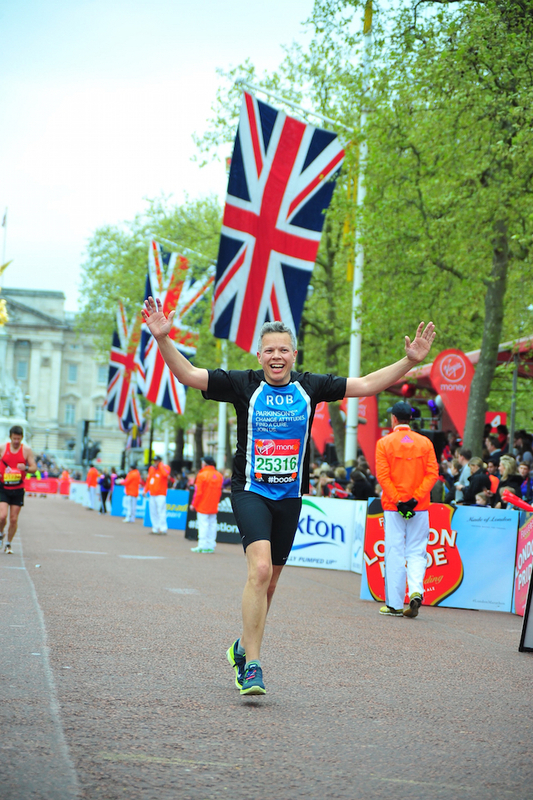 So what inspires you to keep entering marathons to raise money for Parkinson’s? I think it’s kind of self-perpetuating – you know, I wanted to get into running, and then I ran a marathon and you can’t help but run another one. And another. And another. And now I do this running podcast, with my fellow comedian Paul Tonkinson. As a comedian and a runner, I know that I can fundraise. It now feels like if I do a marathon without fundraising, then that’s money that Parkinson’s UK is missing out on. What advice do you have for other people running to raise money for Parkinson’s? I would absolutely recommend running a marathon, but I think you need to be realistic about how hard it is to run one. If you don’t think you ought to, then do something else – do a 10km run, or a 5km run. But you have to be realistic about what a commitment it is as the training gives shape to your whole year. Do you think that Parkinson’s can inspire comedy? I think it really can. My friend Paul Mayhew-Archer is a sitcom writer who lives with Parkinson’s. He’s just started doing stand-up comedy about Parkinson’s and it’s great – it’s good comedy and it’s funny. If someone can make you think about the condition, while making you laugh about it, then that’s brilliant. I think we should be reminding people that Parkinson’s affects a lot of people in a lot of different ways. If we don’t then people easily slip back into just thinking that it’s something that makes old people shake. But there’s obviously a lot more to it than that. It affects young and old and shaking is just one of the symptoms. What are your hopes for Parkinson’s treatments in the near future? In terms of my dad’s situation, the medicine is keeping his symptoms at bay so that he can still do certain things. But I think in the wider scheme of things, finding a cure is very important. 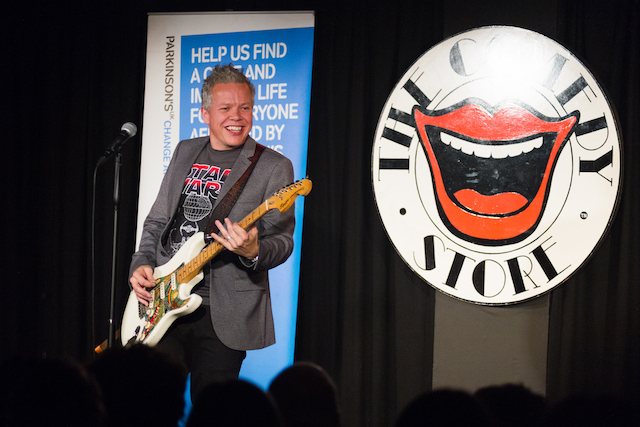 Rob hosting the Parkinson’s UK fundraiser ‘Shake with Laughter’. For more information and advice see the Parkinson’s UK website. For comprehensive information about exercise, physical wellbeing and Parkinson’s, please visit the European Parkinson’s Disease Association (EPDA) website.